Our Fall Harvest has a brilliant green coloration, an expressive intense aroma, with a savory, fruity and peppery aftertaste. This Eclectic Olive Oil garnishes freshly cut salads and delicately prepared vegetables, revives grilled seafood, drizzles over warm wood oven baked bread topped with mountain oregano – accentuating its exquisite fruity aroma and taste. 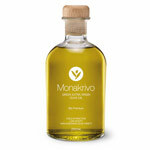 Both our Autumn and Winter harvests are hand picked, producing an unfiltered and decanted extra virgin olive oils. 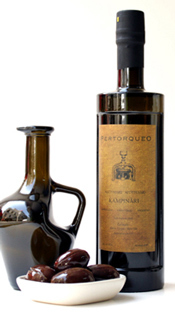 All our olive oils are decanted in a number of individual 350ltr stainless steel airtight containers. Medium sized storage tanks allow for small batch bottling and flexibility in temperature and humidity control in our own Stonebuilt Storage Tower. Decanting periods vary according to yearly varietal characteristics and weather conditions, from 60 to 310 days. Formats used for bottling are UVAG glass bottles and stainless steel containers (depending on market of export). Our Analysis Methods follow E.U. Regulation 1989/2003, IOOC EVOO Standards. Plantations that were once our grandfather’s and father’s fruits of life have now become our little culinary playground. Our produce is grown in two estates, each with its own micro climatic attributes serving thus in the cultivation of specialized products. In total, they total in over 350,000 square meters of cultivated land. Our Estates are situated in the southernmost peninsula of Ancient Greece, on the shores of the Laconian Gulf, in the historic gardens of the palaces of Leonidas and Menelaus. They are shadowed by the majestic snowy peaks of Taïgetos and Parnonas Mountain ranges, they abide to the provincial rule and protection of Spartan Mystras and Monemvasia Castles, and illuminated by the guiding light beacons of the Stone Towers of Gytheion and Neapolis. Of up most importance is for us that cultivation growth be rigorously controlled to abide by “Traditional & Phyto-Organic Growth Standards”, in order to continue growing uniquely flavored and quality assured gourmet products.